Ultimately this is an issue of political will, or political capital, for affordable housing. What is needed is a constituency of private and public sector actors, of government officials, private developers, local employers, and nonprofit developers, to coalesce and mobilize around the need for affordable housing. The case for affordable housing is pretty self-evident. What is often missing is the political will to do something. The effort needed is in the shape of looking at housing much the way we look at other kinds of infrastructure. Like the necessary infrastructure of water, sewer, and roads, without affordable housing, the economic advance of our region will slow, without question. 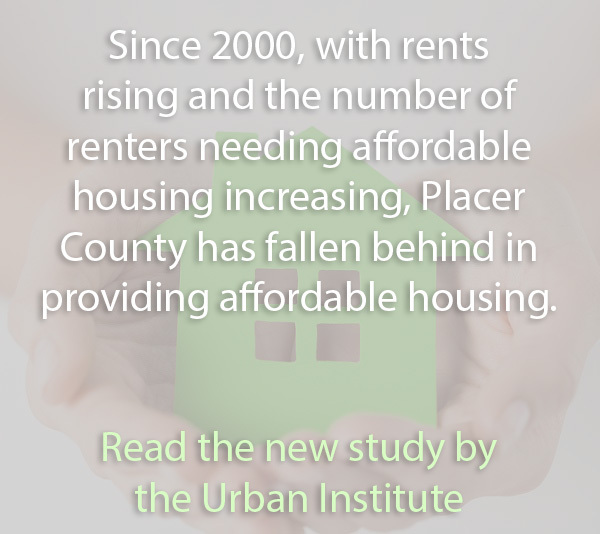 It is the purpose of Placer Housing Matters to help make affordable housing for all a part of our future. Let your local elected officials know your views. Please note that Placer Housing Matters is not a service provider and does not build or manage affordable housing.